And just when we thought we had seen the end of walking on the road, the start of Day 10 saw us back on the road as made our way south to the town of Owhango (pronounced O-fan-go) and the start of the 42 Traverse. You can read all about our previous days of this adventure here: Day 1 & 2, Day 3 & 4, Day 5 & 6, and Day 8 & 9. 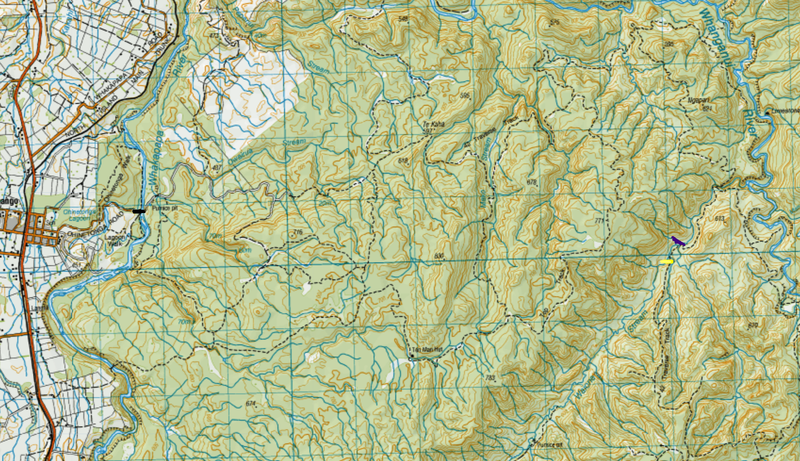 Starting at 8am with a 30-odd kilometre day ahead of us, the plan was to walk 17kms into Owhango, wait for Keith, and then take a left through town to the start of the Traverse and hike roughly another 15 or so kilometres. 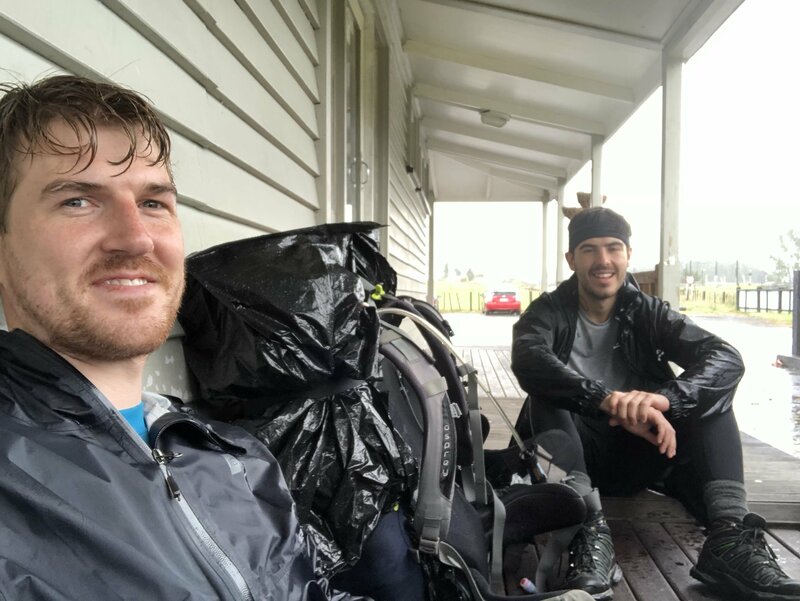 But first, Matt and I had to deal with a few hours of icy cold rain and a sharp wind that was so strong that it made it increasingly difficult to walk alongside the highway. Despite all of this, we still made it to Owhango by 11:30am as took very few breaks due to the conditions. If you’ve been following this blog series, and the associated social media content I’ve been putting out, you may have noticed that Keith rarely featured in Day 1, 2 or 3 apart from the campsite. In the lead up to the trip, Keith’s knee wasn’t in the best condition but still good enough to do a variation of our entire trip. Saving his knee for sections such as The Timber Trail, 42 Traverse and the Mount Ruapehu Walking Track, Keith’s plan was to find his way to where we would be via bus. He did this for Day 1, 2, 3, and would do so from the Taumarunui Holiday Park to Owhango, but he was able to start a little later given it was only a 15-minute drive. But this worked to mine and Matt’s advantage as we were able to stay in touch with Keith via phone and thank God we were able to. 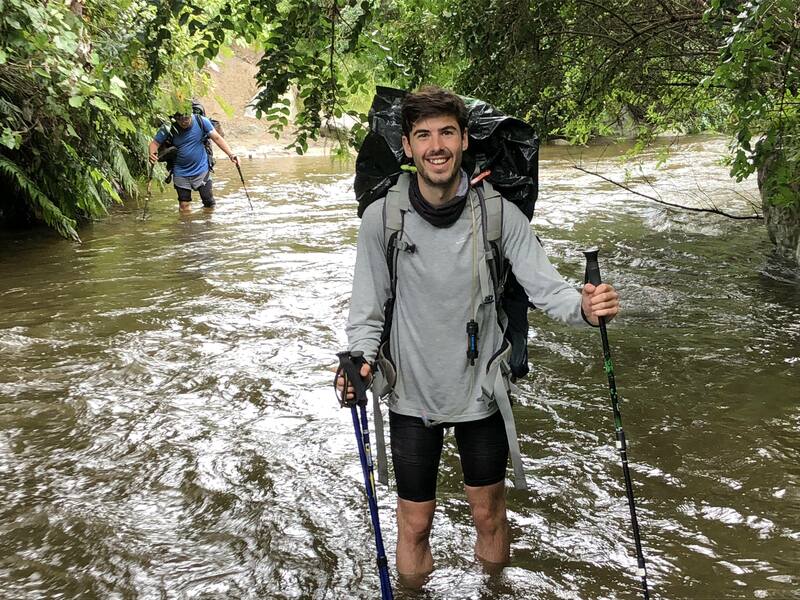 Keith was able to let us know that the rain was going to maintain for most of the day and that the various river crossings on the Traverse would be almost impassable. The good news was that rain would back right off overnight, but the bad news was that we had to bunker down in Owhango for the night and reconfigure our trip slightly. 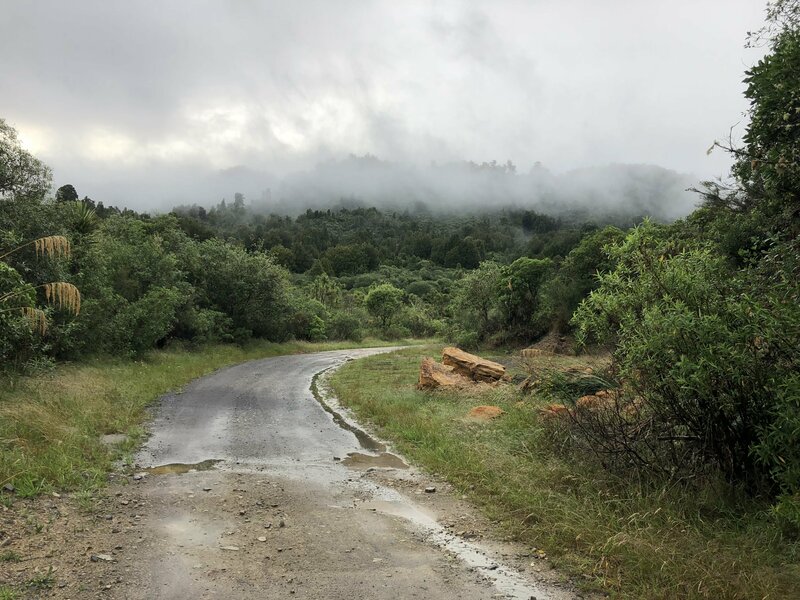 Before I get into Day 11 and our adventure on the 42 Traverse, I have to tell you a side story about the town of Owhango. This town is bordering on a ghost town. It has one main road running through it, a couple of side streets with various houses, a seemingly closed bar/restaurant/adventure lodge with accommodation attached to it and that’s it. 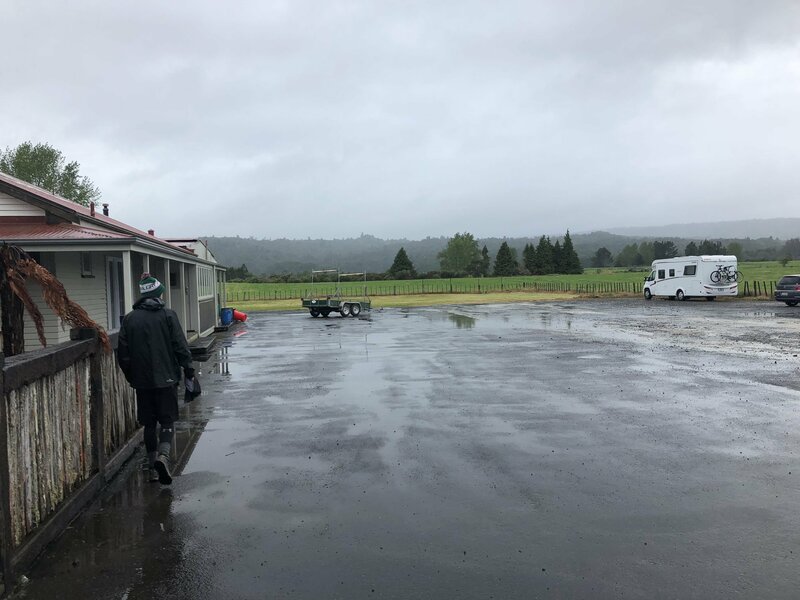 The adventure lodge also ran walking and mountain bike transfers in the Ruapehu area as well as transfers along the Whanganui River. We managed to secure ‘accommodation’ through the adventure lodge and told Keith to meet us out front when he arrived. However, our accommodation wasn’t going to be at the lodge. We were picked up in a van by the owner and driven to a property that was basically three houses in one. He had several of these in different locations within the area. To cut a long story short – the owner of the adventure lodge basically owned the town. Not only did he have the only lodge, restaurant and tourism company in town, but it would appear he owned several properties; of which were similar to those government/CIA half-way houses you see in some movies. We were charged to stay there for the night but he did mention that if we were TA walkers or had booked one of his tours then the accommodation would have been free. His business model was pretty good: buy a full-day tour which gave you free accommodation, and if you wanted something to eat and drink where could you go? That’s right – his bar and restaurant. 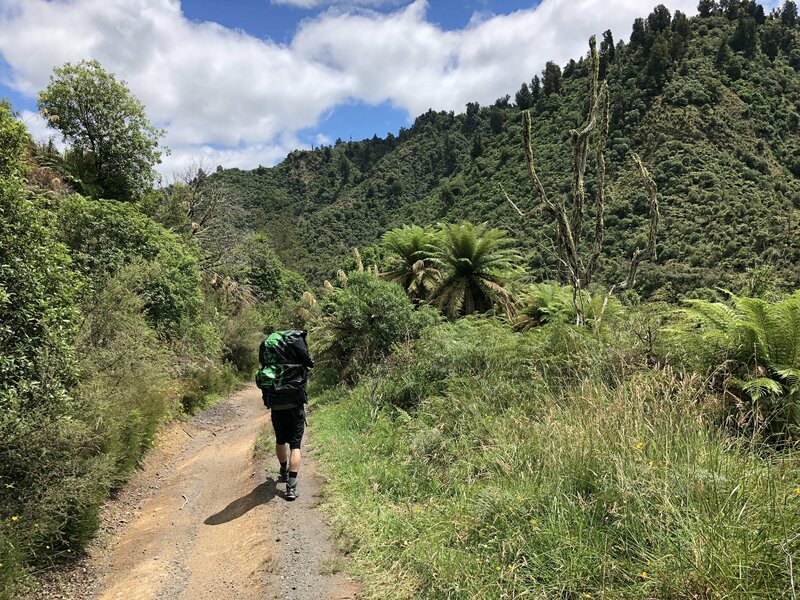 Yet another section of the Te Araroa trail, the 42 Traverse is a 46km multi-use trail that is located in the Tongariro Forest Conservation Area. 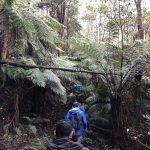 Named after the forest, originally called the State 42 Forest, the 42 Traverse is a reasonably challenging trail with many small-to-medium river crossings. 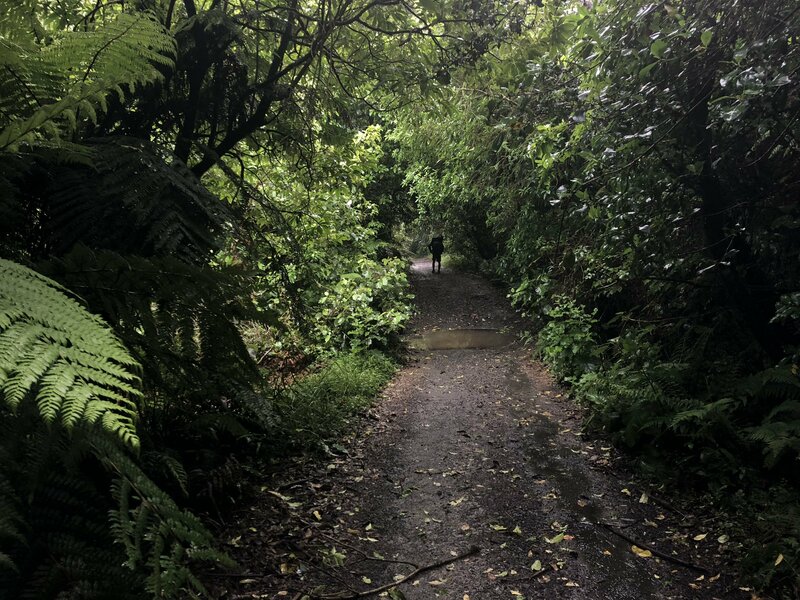 The trail can be done one of two ways – Owhango to Tongariro or vice versa – with the latter being the somewhat harder of the two as it’s a gradual uphill. 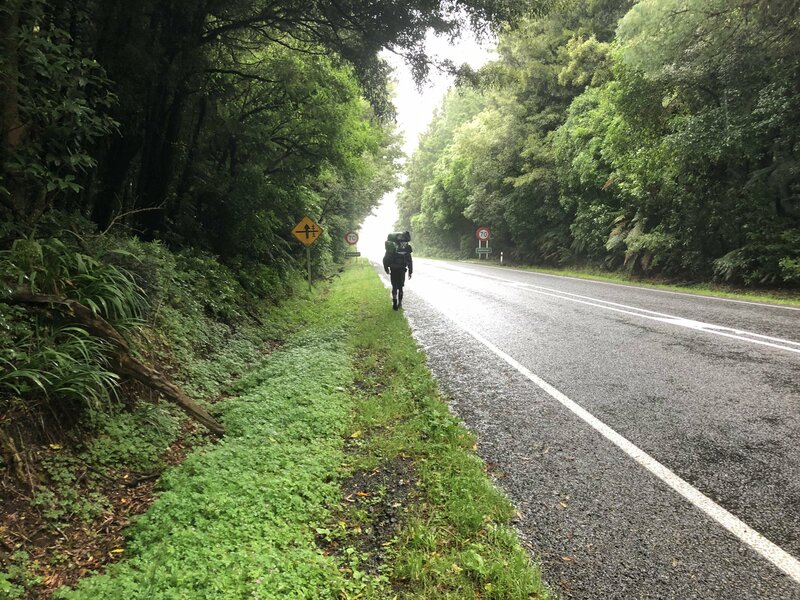 Starting on the east side of town at 6:30am in amongst a little drizzle, we followed a metalled road to a bridge crossing the Whakapapa River to begin the Traverse. Much like The Timber Trail, given the Traverse is mainly used by mountain bike riders, it’s a wide path that is incredibly well-formed. 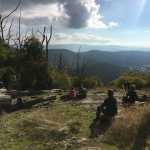 Our plan was simple – aim to hike 30kms for the day and camp between the 25-30km mark. The only issue we had is that the way we were heading had no designated campsite. 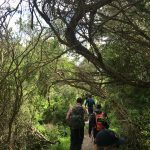 However, every so often we did notice several large green patches of grass to the side of the trail that were big enough for 1-2 tents. So, we were fairly confident we would find something reasonable for the night. 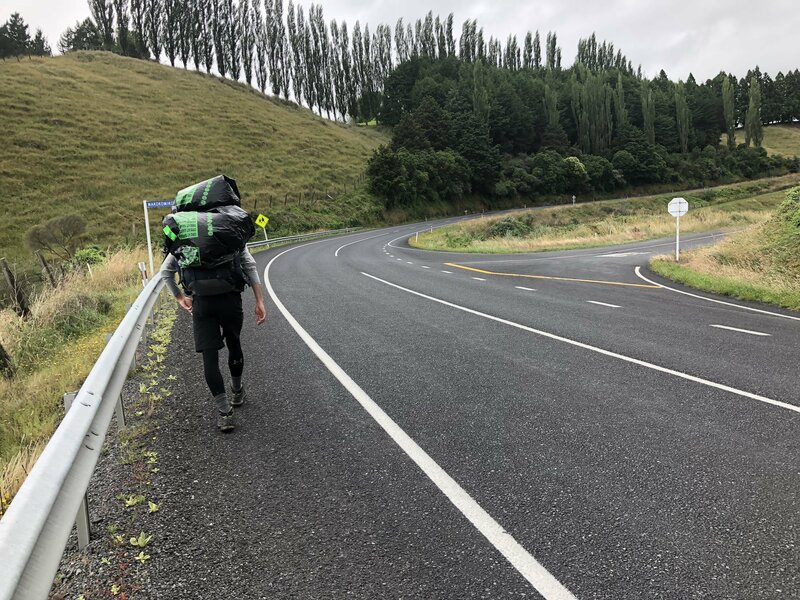 While the initial river crossings weren’t so bad and may have been able to be crossed the day before, there was one river crossing – the Waione Stream – that would be have been impossible to cross. In fact, when it came time to cross, the water was just below our knees and incredibly icy cold. Hiking Tip: hiking poles have more uses than keeping you steady on hills. They’re also great for testing the water’s depth to determine whether it’s safe to cross. Not long after, we found ourselves a really nice campsite. In fact, it was more significantly bigger than any of the previous spots we had seen. 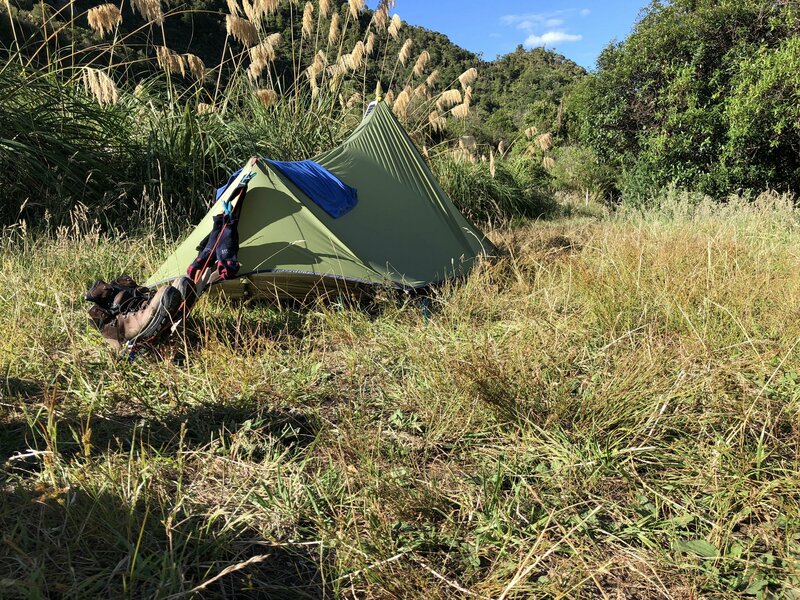 With enough room to house roughly 5-7 tents, it’s ideally located near the stream which means accessing water to filter and to cook with was incredibly easy. If the weather turns bad, don’t push on regardless of how confident you are in your abilities. Particularly in a country such as New Zealand where the weather can turn bad fairly quickly. You can always adjust your plans if need be and find another way to get to your final destination. We had a couple of alternative plans up our sleeve, but it just so happened that Plan B turned out to be the one that worked.